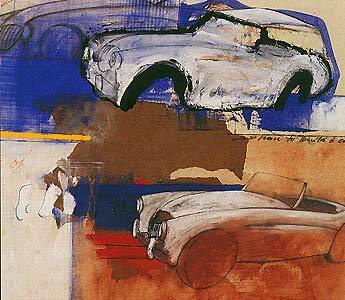 From a very early age Luxembourg-born Robert Brandy has been fascinated by British sports cars. He explains: I have vivid memories of being six and admiring a family friend's green MG TC. Then the first car I drove was a Ford Anglia. After military service I bought a Frogeye', then, two years later, a Healey 100/4. Sadly I had to let them go due to a lack of funds to rebuild them, but I vowed to buy another when I could afford it." For the next decade, as Brandy struggled to make his name as an artist, a VW van complete with bed was his transport. Then in '83 he bought another Frogeye'. "It took me four years to restore it which was an enjoyable diversion from painting," he says. "The Sprite even became the centrepiece of my show at the Galerie Municipale in Esch-sur-Alzetta." 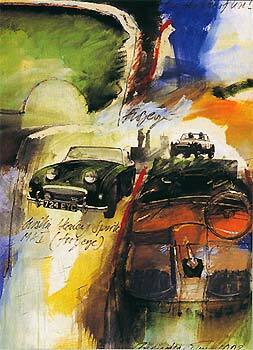 The Healey was joined by an MGA coupé but it wasn't until '93 that Brandy's passion for English sports cars was revealed in his painting. 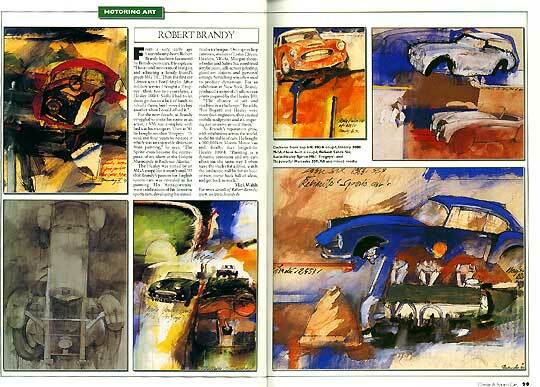 His 'Auto-portraits' were celebrations of his favourite sports cars, developing his mixed-media technique. 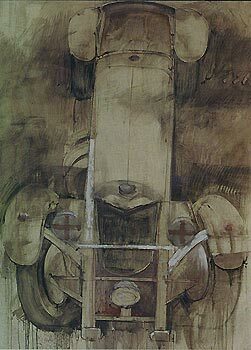 Over sprawling canvases, studies of Lotus Eleven, Healeys, MGAs, Morgan three-wheeler and Sabre Six combined acrylic paint, silk-screen printing, glued-on objects and personal jottings. Scratching was often used to produce dynamism. 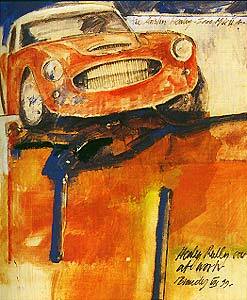 For an exhibition in New York, Brandy produced a series of 25 silk-screen prints inspired by the Healey 100. "The alliance of art and machine is a challenge," he adds, "but Bugatti and Healey were more than engineers, they created mobile sculptures and it's inspiring just to move around them." 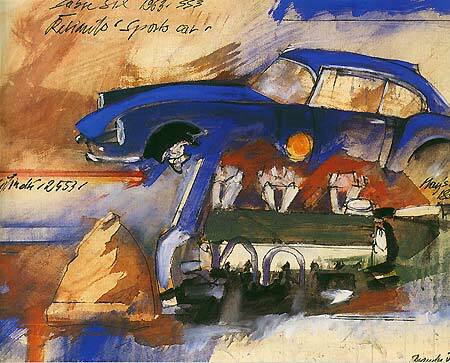 As Brandy's reputation grew, with exhibitions across the world, so did his stable of cars. 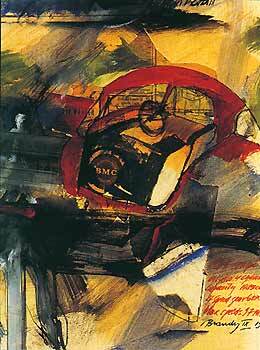 He bought a 300,000km Morris Minor van and, finally, that longed-for Healey 100/4: 'Painting is a dynamic sensation and my cars affect me the same way I often leave the studio for a drive, watch the landscape roll by for an hour or two, come back full of ideas, and get back to work."